Intermatic EI200 Series 1-Pole 1-Wire Electronic countdown timer with preset time, has input voltage rating of 120-Volt AC at 60-Hz. 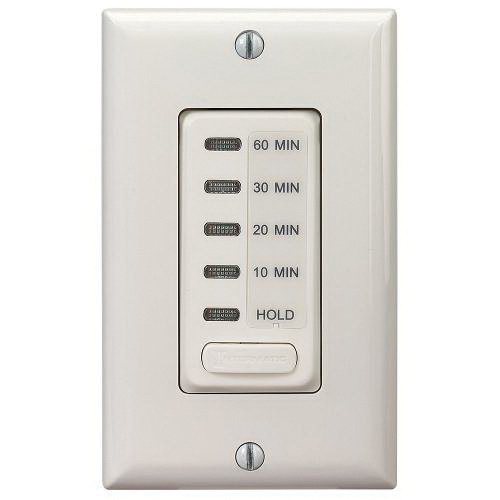 This timer with 10/20/30/60-min time range, has a dimension of 1.75-Inch x 1.44-Inch x 2.79-Inch. It has current rating of 15-Amps at 120-Volt AC for 1800-Watt heater resistive, 8.3-Amps at 120-Volt AC for 1000-Watt incandescent tungsten and 20-Amps at 120-Volt AC for magnetic ballast. This light almond colored timer with auto shut-OFF action, has maximum load rating of 1/4 hp at 120-Volt AC and consumes power of 1800-Watts. It supports in-wall mounting and has operating temperature rating of 0 to 50 deg C. This timer is great for use with decorator-style wall plate. It is perfect for use with bathroom fans, spas, hot tubs, storage closets and garage lights. Timer is cULus listed.